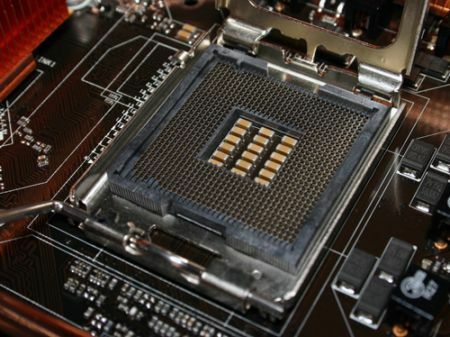 The motherboard socket connects the motherboard to the CPU; e.g. socket 478 ATX motherboard (this socket is being replaced by LGA 775). Understand definition motherboard; and when to replace motherboard. A motherboard socket is the connector on the motherboard that holds the CPU. Sockets use what is called a Pin Grid Array (PGA) which uses short stiff pins on the CPU that line up with the holes on the socket. It is very important when installing a CPU that you do not force the CPU. If lined up correctly, it should drop right in. 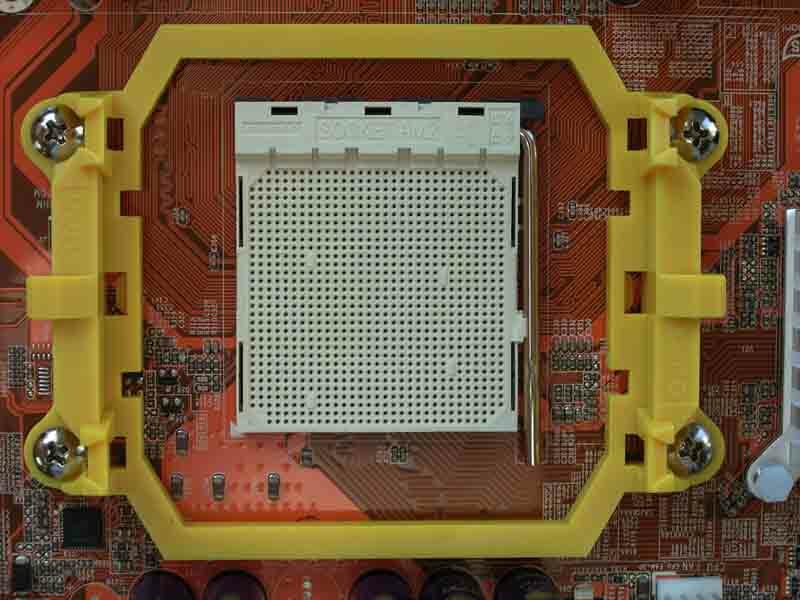 To make this process easier, newer motherboard sockets have the pins built in, and the CPUs have contact points on them. These are called Land Grid Arrays (LGA). When looking for a motherboard, the CPU you select will determine which socket you will use. Below is a chart that shows which sockets were made for the various CPUs. Socket A (also known as "Socket 462") - Supports: Athlon, Athlon XP, Athlon XP-M, Duron, Athlon MP, and Sempron processors. Socket 754 - Single-processor socket featuring single-channel DDR-SDRAM. Supports Athlon 64, Sempron, Turion 64 processors. Socket 939 - Single-processor socket featuring dual-channel DDR-SDRAM. Supports Athlon 64, Athlon 64 FX to 1 GHz, Athlon 64 X2, Opteron 100-series processors. Socket AM2 - Single-processor socket featuring DDR2-SDRAM. Replaces Socket 754 and Socket 939. Supports Athlon 64 FX, Athlon 64, Athlon 64 X2 and Opteron processors. Socket AM2+ - Socket for single processor systems. Supports Athlon 64, Athlon 64 X2, Opteron, Phenom. Features support for DDR2 and HyperTransport 3 with separated power lanes. Replaces Socket AM2. Socket AM3 - Future socket for single processors. Features support for DDR3 and HyperTransport 3. Planned to launch mid 2008. Replaces Socket AM2+ with support for DDR3-SDRAM. Socket F (also known as "Socket 1207") - Supports: AMD Quad FX platform. Socket P - Intel-based (replaces Socket 478 ATX motherboard and Socket M). Released May 9th, 2007. Socket H (LGA 715) - a future replacement for the current Socket T (LGA 775). Socket B (LGA 1366) - a new socket for future Intel CPUs incorporating the integrated memory controller and Intel QuickPath Interconnect. Other brand-name motherboard manufacturers include ASUS, ABIT, MSI and more. Make sure that you understand the relationship between the motherboard and the CPU (short definition motherboard - motherboard is the heart and CPU is the brains). If you need to replace motherboard, you will need to replace the mobo with a unit that is compatible with the CPU.